Augmented Reality got exponentially more popular in recent years but it’s been around for longer than you might think. The first reference to AR comes from the beginning of the 20th century. You might know Lyman Frank Baum for his most popular work “The Wonderful Wizard of Oz” but in 1901 he published an illustrated novel called “The Master Key” where he imagines a kind of augmented reality. He describes a “character maker” – a set of electronic spectacles, that when you view someone through them, the spectacles would show a letter on that person’s forehead regarding their character. The protagonist even jokes that this technology is “a century ahead of the times”. AR makes its real debut many years later – in 1968. 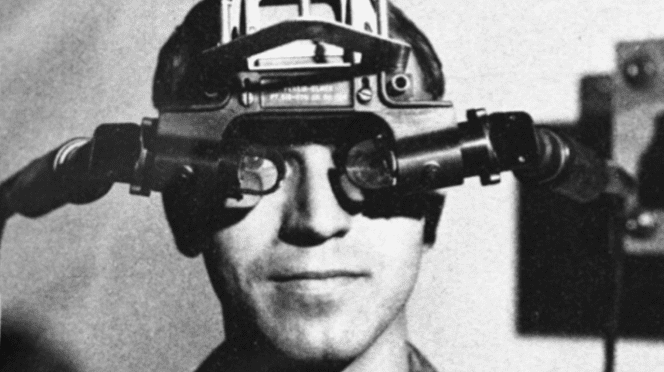 The computer scientist Ivan Sutherland developed the first ever VR and AR head-mounted display (HMD) system, called “The Sword of Damocles”. It used computer-generated graphics to show users simple wireframe drawings. Six years later, in 1974, computer artist Myron Krueger established an “artificial reality” laboratory called “Videoplace”. It combined projectors, video cameras, and special purpose hardware that emitted onscreen silhouettes, surrounding the users in an interactive environment. Fast forward to 1990 when the term “augmented reality” is used for the first time. It was used by the Boeing researcher Tom Caudell. His colleague David Mizell and he proposed that workers configuring the airplane wiring wear HMDs that would project airplane schematics onto reusable boards. In the next decade augmented reality technology got a lot more popular and was used in various fields. Louis Rosenberg developed “Virtual Fixtures” in 1992 – one of the earliest functioning AR systems, built for training pilots in the US Air Force. The same year, a team of people from the Columbia Univeristy built an HMD with trackers attached called KARMA – Knowledge-based Augmented Reality for Maintenance Assistance. 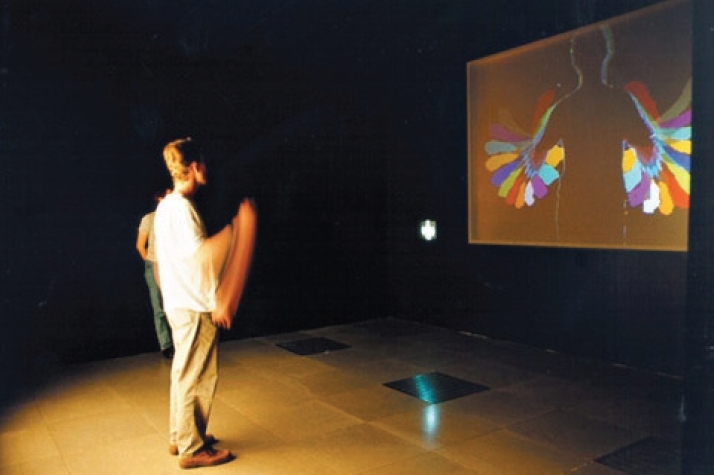 Two years later, in 1994 Julie Marin created the first AR theater production “Dancing in Cyberspace” with acrobats dancing around virtual objects on a physical stage. If you’ve ever watched NFL, you know how the TV broadcasts show yellow markers for first down. This happened for the first time in 1998 during a live NFL game and watching NFL on TV instantly became so much better, that today we feel kinda confused when there are no markers on the screen. In 1999 the NASA X-38 spacecraft was flown using a Hybrid Synthetic Vision system that used augmented reality to overlay map data to provide enhanced visual navigation during flight tests. A year later Hirozaku Kato created the ARToolkit – an open-source software library that combined virtual graphics with real life using video tracking to overlap computer graphics on a video camera. In 2009 the ARToolkit brought AR to web browsers. In the same year Esquire Magazine prompted their readers to scan the cover to make Robert Downey Jr. come alive on the page. This was the first time a print media used AR. AR became a lot more popular in more recent times, and especially after 2013. Google started working on the “Glass” and just a few months after Google opened their “Glass” to developers, car manufacturers Audi and Volkswagen showcased their own AR mobile applications relating to instruction manuals and remote assistance services. And even though the “Glass” wasn’t a successful project, it was a very important step into the future. Wearable AR technology is surely a part of our future. Who knows what future holds? We’re definitely not far from the time where AR will be a huge aprt of our daily life. Maybe one day you’ll even be able to send an AR greeting card, how cool would that be? Oh, wait… you can actually do it now! This entry was posted in iGreet stories and tagged ar, augmented reality, future, greeting cards, history, ivan sutherland, sword of damocles.